Meet Beyond the Bagel. Friend of the Mile-End Business Association. Kat Romanow is a Jewish Food Historian, the director of Fletchers Espace Culinaire, and co-creator of 'Beyond the Bagel'. As co-creator of Beyond the Bagel, a Mile-End food tour run by the Museum of Jewish Montreal, please take us to bagel school. What’s the history behind the bagel? Alright! Well, bagels are thought to have originated in Poland and spread throughout Eastern Europe. They were more of an everyday bread and rather than being made in bakeries, they were often made by women, by housewives, in their homes. Their husbands or kids would go out and sell the bagels to help bring in extra money for the family. The bagels were sold off sticks or out of baskets. The way people were eating them then was different than the way we often do now in Montréal. Back then, they wouldn’t spread bagels with cream cheese or eat them with lox. Cream cheese is a North American invention, so they didn’t have it in Eastern Europe at all. They would eat bagels plain or spread them with schmaltz which is rendered chicken fat. It was a quick, portable, easy meal or snack to have. 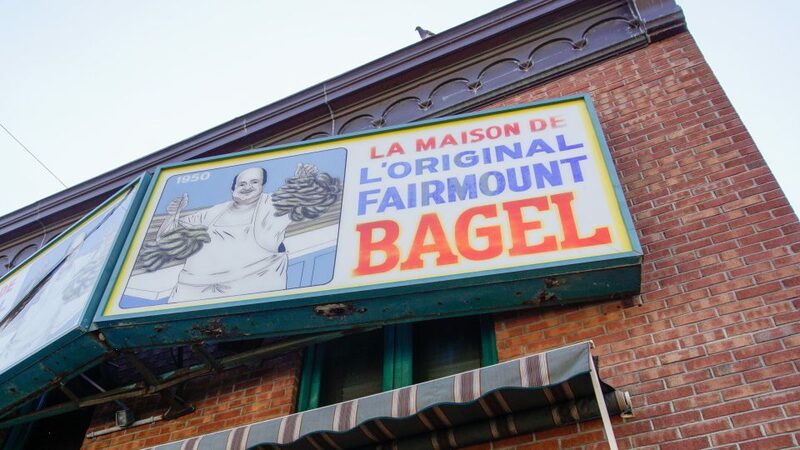 Controversial question: St-Viateur bagel or Fairmount bagel? Everyone in Montréal has their bagel preference. They’re a Fairmount person or St. Viateur person and they see them as two really distinct businesses. But what’s fascinating is that they both originated from the same businessmen and the same place. The first bagel bakery in Montréal was on St-Laurent just south of Schwartz’s in an alleyway. Three people ended up running it. Two of them, Isador Schloffman and Heimann Seligman, decided they’d open up another bagel business in this area and so they bought the building where Fairmount Bagel is now. They opened it in ’49 and ran it with Isador’s son, Jack. But Heimann and Jack didn’t get along. So Heimann left in ’51 and opened up St-Viateur Bagel in ’53. Fairmount Bagel closed for about twenty years and reopened in ’79. There have been the two bagel bakeries since, and I think it’s fascinating to disrupt people’s ideas that these are two very separate bagel bakeries when in fact they started from the same people. Alright, you didn’t really make a choice. I respect the diplomacy. Do the two famous bagels taste different to you? They do taste different! I think it’s very subtle so you really have to pay attention. For me, St. Viateur Bagel is always a little more golden on the outside with more brown spots and not as sweet as Fairmount Bagel. The sesame flavour is more forward. Fairmount Bagel is definitely a little sweeter and often bigger in terms of size. Let’s go beyond the bagel. What’s another iconic stop on the tour? Wilensky’s. It has been around since 1932 and throughout its history, it shows the transformation of the neighbourhood. 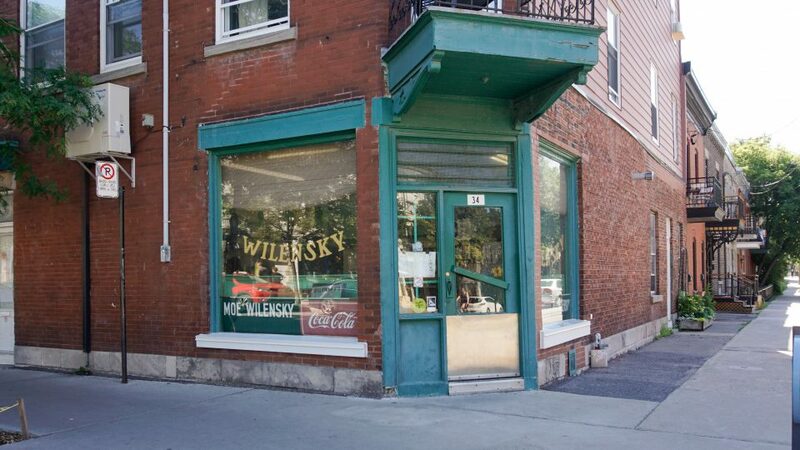 Wilensky’s first opened on the corner of St. Urbain and Fairmount, a block over from where it is now. The founder Moe Wilensky and his father had a barber shop at that original corner. But it wasn’t bringing in a ton of revenue so Moe decided he would try to help the business by opening a candy, cigar and newspaper shop within the barber shop. A salesman came to the shop one day to sell him a sandwich press, which, you know, in the 30s was going to cost him sixty eight dollars which was a huge amount then! Despite his father thinking he was foolish for buying the sandwich press, he bought it. And it led to the creation of the Wilensky’s Special which is what everyone goes to Wilensky’s for today. Moe would make himself sandwiches for lunch, his customers would see him doing this, and they’d ask him to make them something special too. And so the name stuck. To note, the Wilensky’s Special is beef salami and beef bologna on a pressed roll. The diner moved to its present location in 1952 and all the stuff that’s in this present location was walked over from the original spot. So it’s really like you’re walking into a time capsule. You’re stepping into the Mile-End of the 30s and 40s when the neighbourhood would’ve been filled with working class Ashkenazi Jews. Wilensky’s was serving that population. Many of them worked in the shmata industry, or the garment industry, and they worked long hours and sometimes in dangerous conditions. They didn’t have a lot of money or time to spend on food and so, Wilensky’s Light Lunch was a place they could get a quick light meal that didn’t cost much. 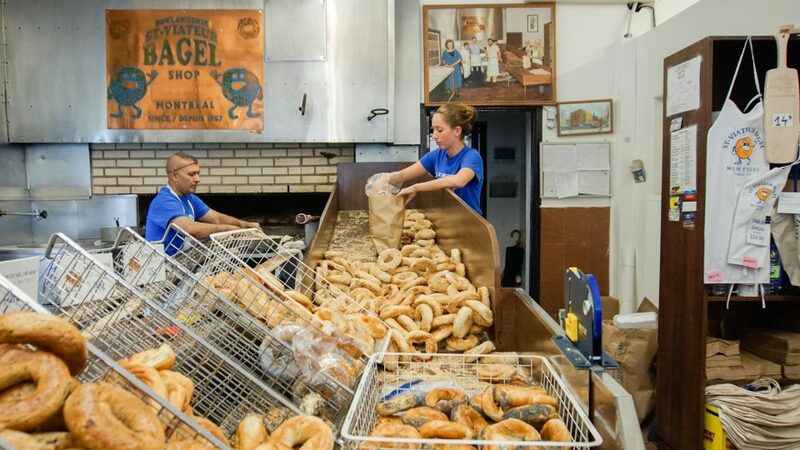 Both of these dishes, especially the bagel, have become iconic Montréal foods, going beyond their Jewish roots and have come to represent the city and the Mile-End. 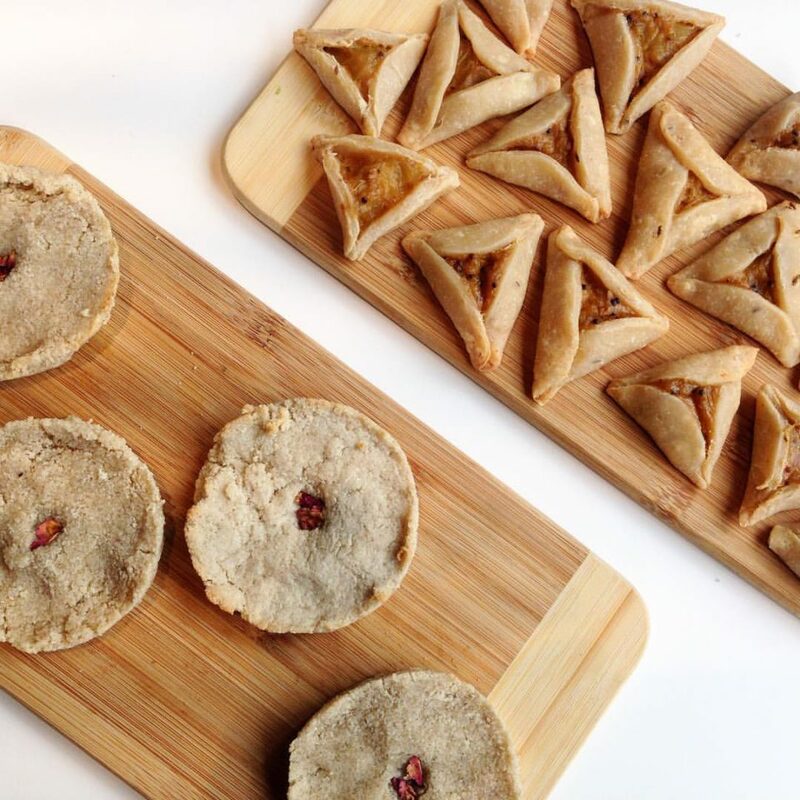 What’s your go-to for something of the sweet and Jewish variety in Mile-End? Cheskie’s Bakery. Let me tell you the story. So, Cheskie’s was opened by this man named Cheskie Leibowitz. He’s originally from New York, he’s a Hasidic Jew, and there’s a very strong connection between the Montréal Hasidic community and the New York one. People often travel and marry between the two. The Montréal Hasidic community is only so big so you sometimes have to go outside to find an eligible marriage partner. When that happens, it’s always the man who moves to the woman’s home or place of birth. That’s because, at least within the Hasidic community, women are focused on domestic life. Men go to synagogue and go to work so they’ll be able to form a new community a lot easier than women. Cheskie moved to Montréal and started a family. In trying to decide what he wanted to do, he was inspired by his brother Shloimy who opened a bakery in Borough Park, New York called Shloimy’s where he served breads and pastries. Cheskie decided he was going to open a very similar bakery in Montréal but name it after himself. He’s selling a lot of pastries (the cheese crown is amazing!) 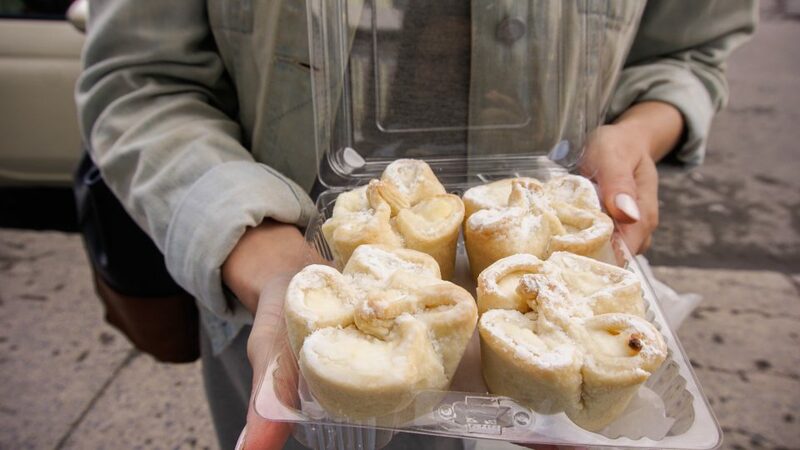 that are also being sold in New York so he brought this NY-style of pastry to Mile-End. It’s probably one of the only places where you can get a black and white cookie in the city. The cookie itself is more cake-like. It’s a plain, vanilla dough with one half chocolate icing and one half vanilla icing. They also sell babka at Cheskie’s and it’s amazing! It’s a yeast dough and very light and fluffy. It’s rolled out and spread with two of the most common fillings: either chocolate or cinnamon. In Eastern Europe they’d often put poppy seeds in it as well. It’s rolled up and baked in a loaf pan. What you get is this soft and sugary and light and gooey and addictive braided dream! 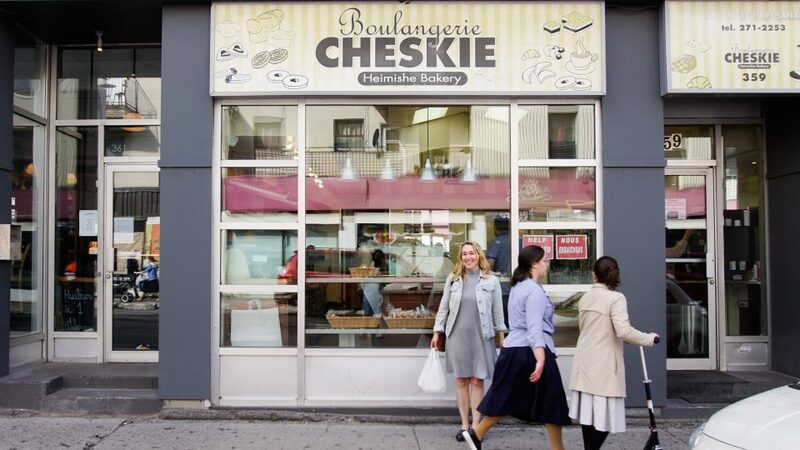 Even though Cheskie’s brought this NY-style pastry to Montréal, it has really become an institution in the Mile-End that both the Hassidic community enjoys as well as everyone else who lives here. Let’s get some babka. But before that, why is babka called babka? The pan that it was baked in was a fluted pan. It looked like a woman’s skirt or like the skirt a grandmother would wear. And so the name babka comes from babcia which is Polish for ‘grandmother’. So that’s where the name comes from. Either because it looks like a skirt or because it’s a bread grandmothers would prepare. “Cook with your grandmother. Hear her stories. For those who don’t know, what’s Shabbat dinner? Shabbat is a day of rest in Judaism. It starts sundown Friday evening and lasts until an hour after sundown Saturday. And if you’re a religious Jew then you’re not going to be doing any kind of work for those 25 hours which includes using any electronics. Shabbat starts off by having this amazing meal on Friday night. 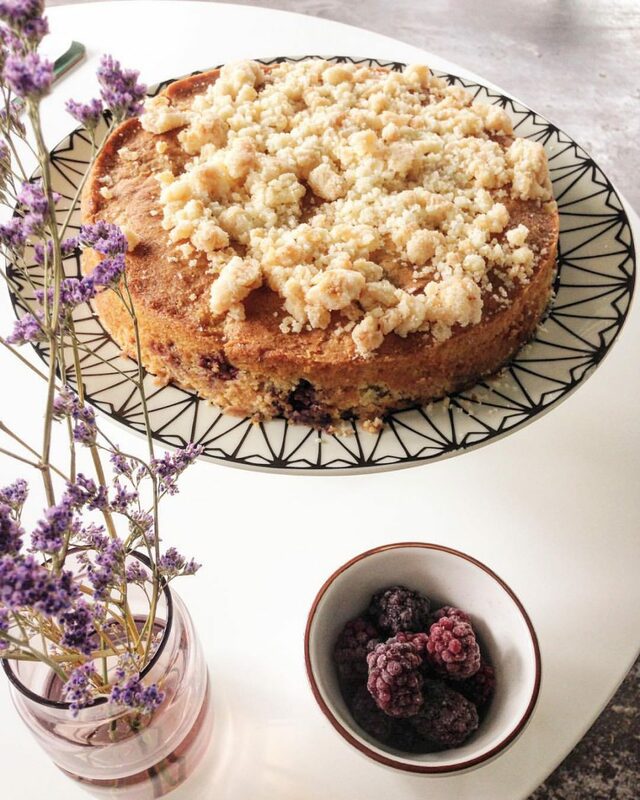 It’s a time to get together with family and friends and end your week by re-connecting with people over food. It feels like a pause and a slowing down. 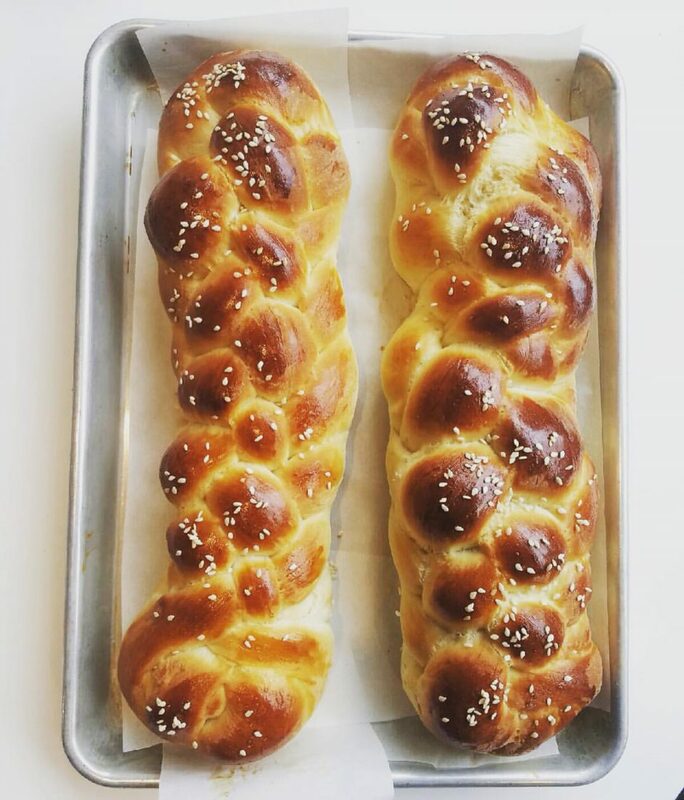 It’s traditional to each challah on Shabbat which is a wonderful braided, egg-y bread. Cheskie’s makes awesome challah here in Mile-End. Dishes you’ll be making on Shabbat will vary from community to community. Ashkenazi Jews will make roast chicken or have matzo ball soup and gefilte fish. Gefilte fish was created to eat on Shabbat because it doesn’t require any work such as cooking. Another law which led to gefilte fish was that you’re not supposed to be separating the desirable from undesirable which would include separating the flesh from its bone. So gefilte fish, gefilte meaning stuffed, is traditionally a stuffed fish. Housewives would take out all the flesh from the fish — I don’t know how they did that keeping the skin in tact which is pretty impressive to me — then take the bones away and mix up the fish with matzo meal and onions and different flavourings and bake it. 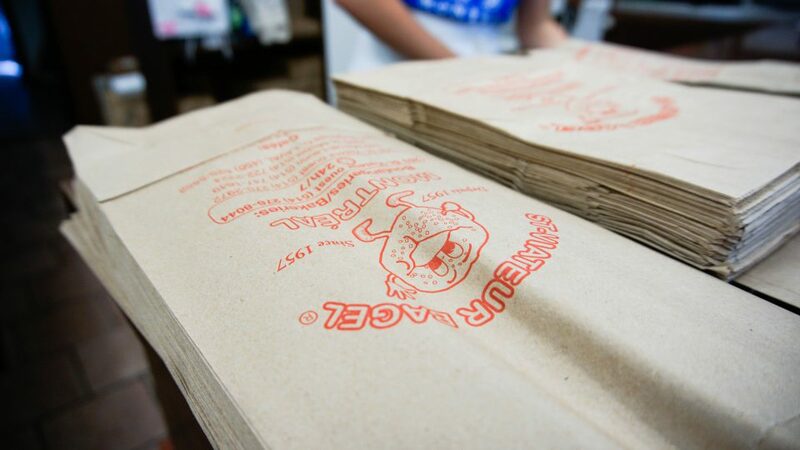 We make it as a loaf at Fletchers. Fletchers is a café but also a culinary education space within the Museum of Jewish Montréal. What’s cooking up there? 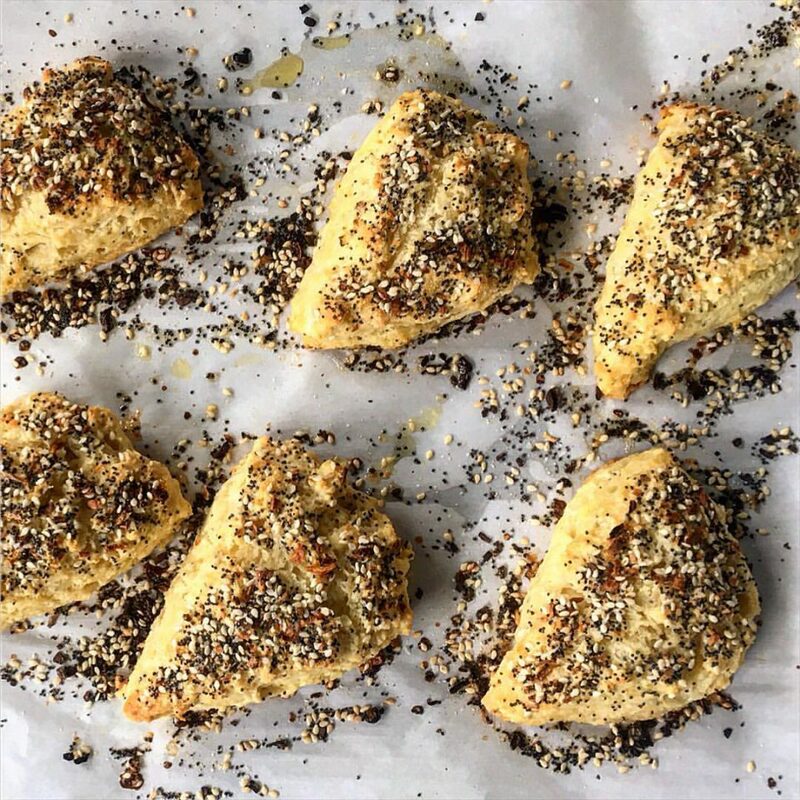 Everything I do there is informed by my training as a Jewish Food Historian and my approach to Jewish food and that’s to try to teach people that it’s way more than bagels, smoked meat, and these Ashkenazi classics that we know of. Before Fletchers I had this project (and still have it) called The Wandering Chew. 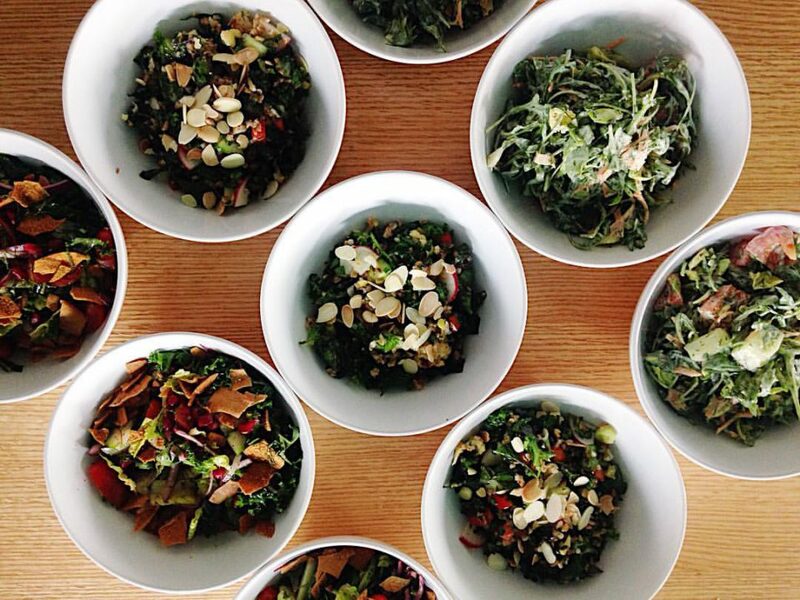 We did pop up dinners where we’d focus on the foods of these lesser known communities. I see Fletchers as an extension of that where people can come in for a meal and the menu brings in flavours from all of these different communities. They can experience Jewish food in a new way and also learn about the history. What’s an Iraqi-Jewish snack we can try at Fletchers? We serve a cookie called massafan. 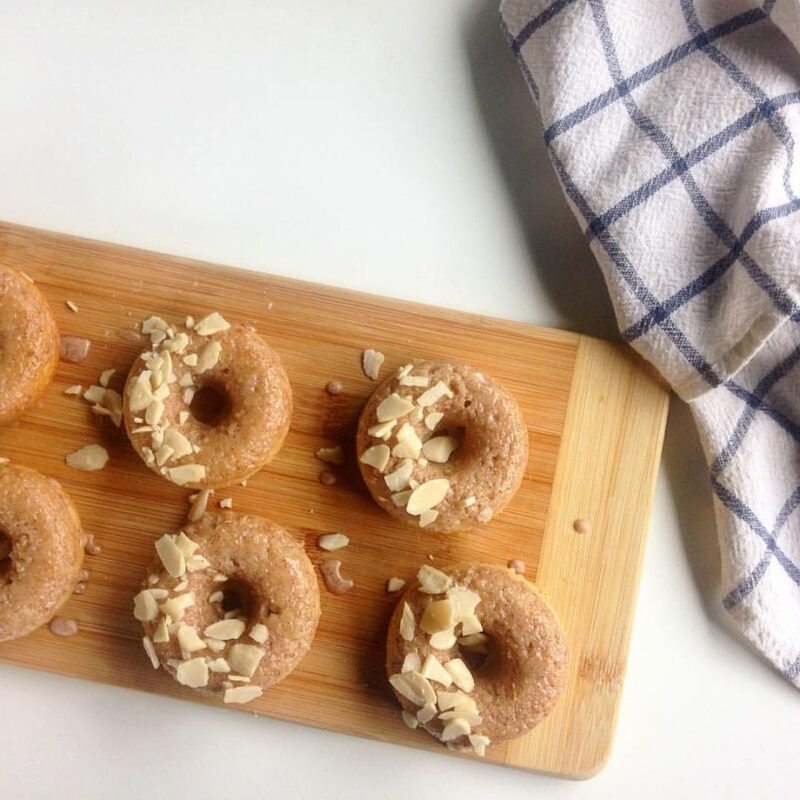 It’s made with almond flour, cardamom and rose water. It’s a pretty simple cookie but the flavours are really wonderful. We got this recipe from a woman who came here with her family from Iraq when she was fifteen. And this is a recipe they’ve been making ever since they got here and she has passed it on to her granddaughters as well. You really can’t find it outside of the Iraqi home. The fact that we’re serving it at Fletchers is, I think, special. People get to taste this dish that maybe they never would’ve otherwise. Who should we all cook with? Cook with your grandmother. Hear her stories. Women hold the key to culture through the food they prepare.